Fun beach design with saltwater seashells in three colors with a premium non slip long wearing backing. Great for kids or a summertime look all year round. 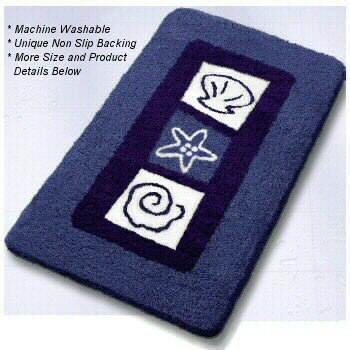 Marine Blue: Rich blue background with a very dark blue border around the center seashell designs. The seashells are outlined in white or dark blue. Coordinated Lid Cover: Solid Marine Blue. Carrot: Bright carrot orange background with a burnt orange border around the center seashell designs. The seashells are outlined in white or burnt orange. Coordinated Lid Cover: Solid Carrot Orange. Ruby red: Ruby red background with a dark red border around the center seashell designs. The seashells are outlined in white or ruby red. Coordinated Lid Cover: Solid Ruby Red.